Looking for a Used iM in your area? CarGurus has 585 nationwide iM listings starting at $8,700. The new-to-the-U.S.-market Scion iM gets beaten in nearly every category by rivals, but still manages to present a competitive, attractive overall package. Even though Scion will start bowing out next year, it's sending one more volley across the field before it leaves with the Scion iM. Based partially on the Corolla and the tC, the iM has been previously marketed as the Toyota Auris in the rest of the world, available since 2006. While it’s true that competitors offer more power, more space, and a more thrilling ride, that doesn’t mean you should discount the little iM. With a surprising list of standard features, 2 years of free scheduled maintenance, and an attractive profile, the iM is still a competitive option. Despite being a subcompact, Toyota aims the iM against larger and more powerful compact competitors like the Ford Focus and the Mazda3, which puts it at a significant disadvantage. When you keep in mind its more humble underpinnings, things are much clearer. But even against other subcompacts, the iM is still one of the slowest in the category and can’t boast class-leading space or agility. What it can offer is a slightly different look and a surprising list of standard features that would spark jealousy in cars costing twice as much. Keeping with Scion’s schtick of offering just one trim level and limited options, you can augment your iM with a rear spoiler, a navigation system, some side molding, graphics, a rear bumper protector, and that’s it (unless you count protection packages). Thankfully, the iM is not outfitted like most subcompacts. Standards such as power-folding heated mirrors, dual-zone automatic climate controls, 17-inch alloys, keyless ignition and entry, and a tilt-and-telescoping steering wheel really set it apart from rivals. In fact, some of these are options you can’t even purchase from certain competitors, especially when you factor in features like the 7-inch touchscreen with rear-view camera. There are strange omissions that come with the one-trim strategy though, because expected safety options like blind-spot monitoring and cross-traffic alert can’t even be purchased. My week with the iM was spent in a version with the 6-speed manual transmission and an MSRP of $19,255. Going for the continuously variable transmission (CVT) will raise that starting point to $19,995, but with the limited power of the iM, the manual is a very attractive choice. This example came with some confusingly expensive options as well, like carpeted floor and cargo mats ($185), wheel locks ($65), and a plastic rear bumper protector for $89. With the $795 delivery and handling fee, total MSRP came to $20,389. 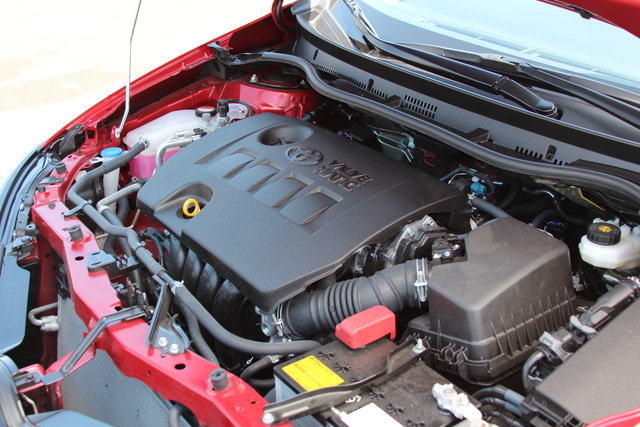 The iM is motivated by a 1.8-liter inline 4-cylinder engine that’s been doing duty in the Corolla for years. It’s not terribly powerful or exciting, but it’s definitely reliable. Still, with 137 hp and 126 lb-ft of torque, the iM’s 10-second 0-to-60 time is nearly the slowest in the segment. The 6-speed manual allows you to make the most of that power, and short gearing in first adds a bit of fun feel if not actual speed. But don’t let the fact that it’s not the fastest in the segment dissuade you from checking out the iM. At least with the 6-speed, it had plenty of power for my week of bombing around the Bay, even enough to climb some pretty steep hills with ease. Usually you’d assume that with one of the lowest power profiles in the segment you’d get some class-leading efficiency, but that’s simply not how the math works here. Estimates are 27 mpg city, 36 highway, and 31 combined with the 6-speed manual, with the CVT adding 1 mpg to all three figures. It’s not that these numbers are disappointing, but once again rivals manage to do a little bit better, and in my week’s worth of driving, my combined figure was just over 22 mpg thanks to having some fun revving that little engine. A lot has been written about the suspension shortcomings of the iM, with excessive body roll earning it derision when pushing it through turns. I never experienced this despite getting quite aggressive with it. It certainly doesn’t have the architecture or ability to be considered truly “sporty,” but it handles itself just fine if you decide to have some fun, and even better it offers a composed ride during normal commuting, even soaking up bumps and irregularities well. For the $20K MSRP, I found it exceeded my expectations. The iM offers a sporty aesthetic from the outside that's likely the source of much of the disappointment resulting from it not being sportier. To be fair, the aggressive angles, optional side skirts, and rear spoiler certainly give the impression of sporting intentions. Couple that with its youth-targeted interior design and standard 6-speed and you can see why people want a bit more. But if you take the iM for what it is—a competent city commuter—you’ll see that it manages to accomplish everything it was designed to do. The sharp angles on the outside offer a slightly different look than most of the competition, and the interior’s simple yet quirky design is a fresh approach to what could have been a boring placeholder. Little details like a cream-colored leather band across the bottom of the dash are certain to turn off some consumers, but it’s unique elements like that which make the iM stand out. A 7-inch touchscreen sits elegantly in a piano-black dash beneath vents tucked neatly into the design. While the leading aesthetic is simplicity, there’s still enough style to make it memorable rather than leaning on ostentatious attempts to set itself apart. Things are even better functionally, with supportive seats and a wealth of interior storage solutions that make commuting and even weekend tripping a breeze. 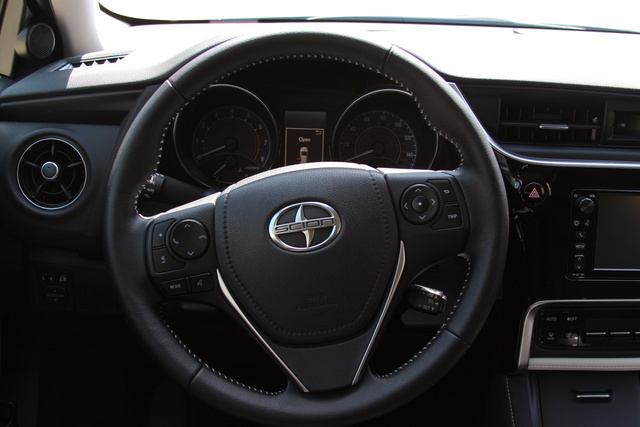 Interior materials are an upgrade for what would normally be expected from Scion, and this is one of the areas where the iM actually outclasses its rivals. 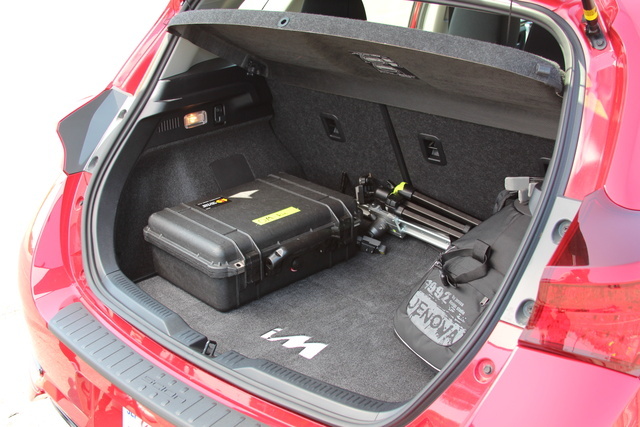 Trunk cargo capacity lands at 20.8 cubic feet, which is respectable but still not class-leading, and turning radius is a similar story at 18.7 feet. What’s really strange is that Scion fitted the iM with an independent, dual-control-arm rear suspension, upgrading the torsion-bar setup from the Corolla. Given they didn’t make any other suspension upgrades, I find it difficult to justify this choice, especially considering the new architecture intrudes on trunk space versus a traditional torsion-bar rear end, not to mention Scion’s goal of keeping prices low. One final caveat: while forward visibility is open and impressive, it’s a different story when looking rearward. The aggressive styling that looks so interesting from the outside means you’ve got a painfully small rear hatch window and some thick quarters obstructing your view. With no standard or optional blind-spot or cross-traffic alerts, it’s something to consider, especially for taller drivers. 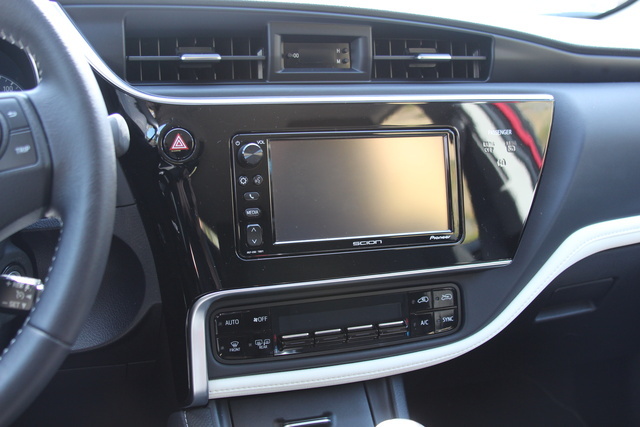 A standard 7-inch touchscreen with a rear-view camera and 6-speaker Pioneer stereo with USB inputs set the iM apart in terms of base-level features offered by the competition. More than that, it looks good and functions well, too, with quick reactions and intuitive design. And while the lack of technological safety features is disappointing, the base inclusion of dual-zone automatic climate controls, power-folding heated mirrors, Bluetooth, and voice recognition are enough to make you reconsider whether having the fastest subcompact on the market is really that important. Let’s hope that when it is rebadged next year as the Toyota Corolla iM, it’ll get some extra tech options that can fill in some of these blank spots. 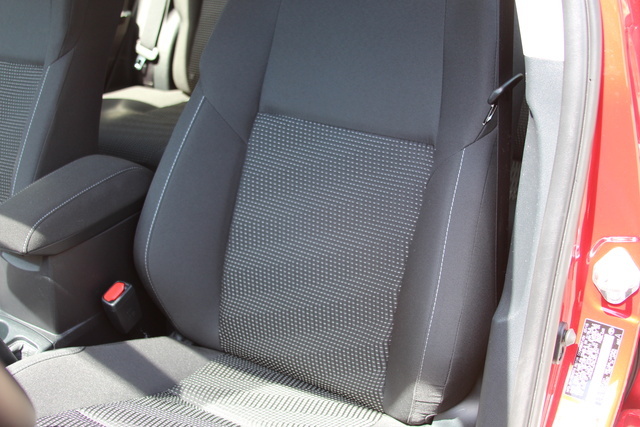 The iM comes with the usual standards of traction and stability control, antilock discs, and a full suite of airbags, including driver's knee and front passenger seat cushion bags. A stop from 60 mph will take around 122 feet, which is about average for the segment, but I’d like to see that drop by a few feet, especially given the iM’s rather svelte 3,000-pound curb weight. Unfortunately, there’s been no testing done of the iM by the National Highway Traffic Safety Administration or the Insurance Institute for Highway Safety, but badged as the Auris, it’s done very well in European testing. Here’s where things get difficult. 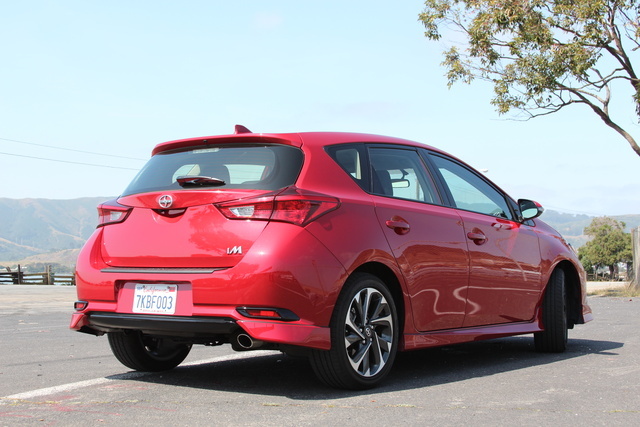 The iM is certainly not the best example of a subcompact hatchback on the market. 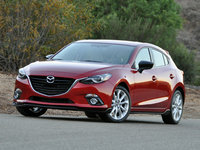 The Mazda3 stands out as a perfect all-around package, the VW Golf is more refined, and the Ford Focus offers more power and a more engaging suspension setup. But for the money, the iM offers more standard features and an unheard of 2 years of free scheduled maintenance at a lower price. Value retention will almost certainly be affected by Scion’s demise, but given that the iM is based in large part on the Corolla, reliability shouldn’t be an issue. No, the iM isn’t the fastest on the market. It doesn’t get the best gas mileage, doesn’t have the most cargo capacity, and doesn’t have the most engaging ride. But it presents a solid second in most of those categories, and with an interesting design and its beefy list of standard features, it makes a strong case for the overall worth of a car being more than just the numbers. If you’re looking for a subcompact hatch, it definitely warrants a look. 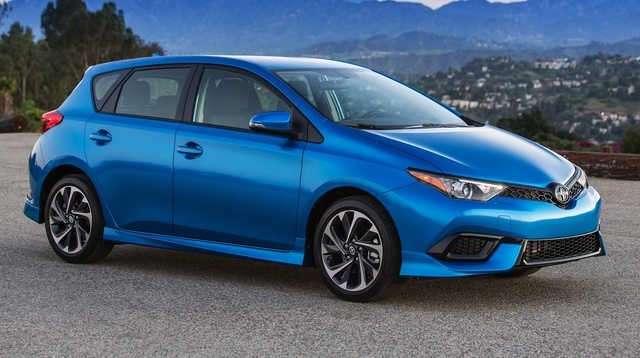 What's your take on the 2016 Scion iM? 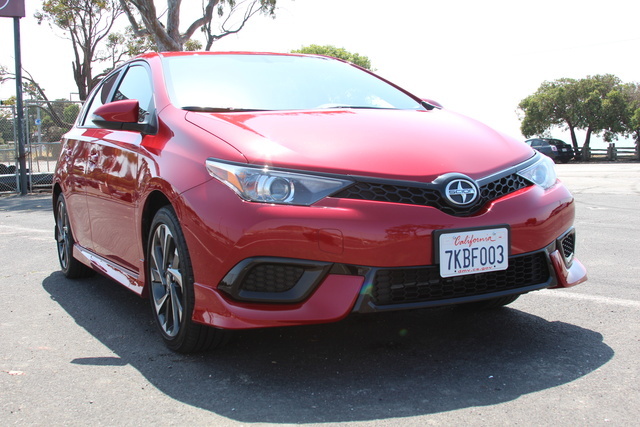 Have you driven a 2016 Scion iM?